More than a decade ago, after the downsizing of his family’s business, Serv-U, Steve Rosenkrantz was trying to decide what to do next. He knew he wanted to run his own business, but didn’t know exactly which path to take. He enlisted the help of a company called Entrepreneur’s Source, which links clients with franchises — and the franchise they linked him with was Entrepreneur’s Source. Since then, he’s helped dozens of couples and individuals take charge of their lives and turn dreams into reality. Tim Scussel still has many good things to say about the McDonald’s corporation. “They were great … they made me an owner when I had no money,” said Scussel, who would eventually go on to operate three outlets for the fast-food chain — one at Mercy Medical Center in Springfield and the others in Enfield. But things didn’t end well between Scussel and the company. Indeed, frustrated by what he considered unreasonable demands for him to essentially tear down and rebuild one of the Enfield locations — among many other things — the franchisee eventually sold out and commenced a search designed to identify what he would do next in terms of business ownership. He didn’t know exactly what he wanted, but he had some parameters. He wanted to remain the kind of hands-on operator he was at McDonald’s — “I was at the stores every day; I was behind the counter working most days,” he said. But he also wanted a franchise, or corporate parent, that was more supportive and less combative. Meanwhile, he and his wife and full business partner, MaryAnn, desired fewer hours, a considerable drop in the number of times their beepers went off, and, overall, far greater control of their own destiny. And Steve Rosenkrantz managed to find all that for them in an outfit called The Maids Home Services. As the name suggests, this is a company that provides cleaning services, in this case for mostly residential clients. The Scussels now manage two such franchises, one serving Western Mass. and the other in the Greater Hartford area. They arrived at this stage thanks to a process that Rosenkrantz, himself a franchisee with a company called Entrepreneur’s Source, describes with a number of words, phrases, and acronyms (like ILWE — income, lifestyle, wealth, and equity — more on that later), but boils down succinctly by saying that he helps people take charge of their lives. 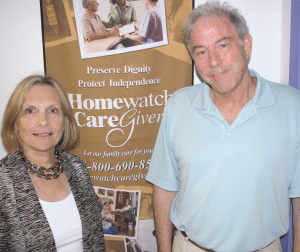 Judy and Peter Yaffe had never worked with seniors or the disabled before taking over a franchise of Homewatch Caregivers. And by that, he meant that he often helps people transition from the corporate world to the realm of entrepreneurship. Put another way, he said he provides people with the resources to take a dream and make it reality. Elaborating, he described his role as being not that of a consultant, but rather much more like a life coach and business coach combined. 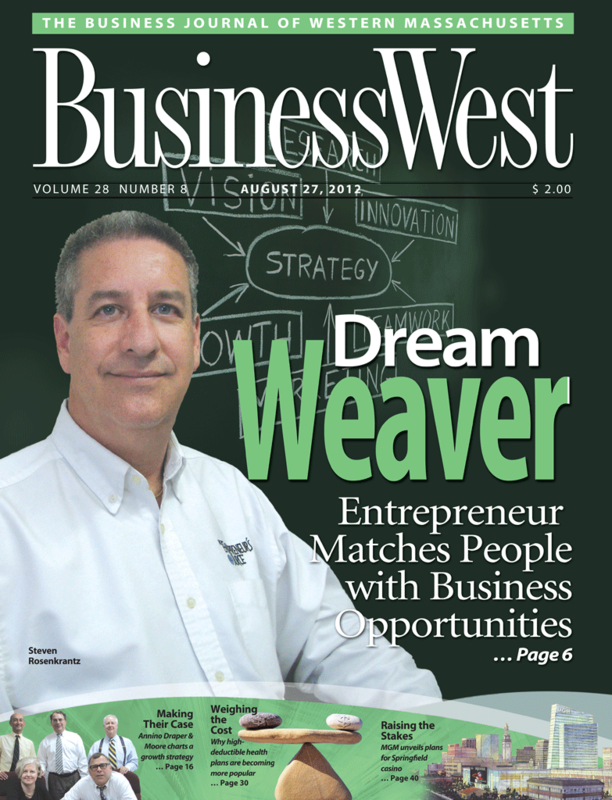 “People tell me what they want their life to be like,” he told BusinessWest, adding that, through an exhaustive process that could last from a few months to several years, he helps them find that life. And very often, it’s with a business they would never have imagined being in. Such was the case with the Scussels, and also with Jim Brennan and Rick Crews, two local businessmen, neither with anything approaching a background in health care, who wound up starting a Doctor’s Express franchise and now have several locally and in the Boston area. And it was that way with Peter and Judy Yaffe, who had never worked with seniors or the disabled, but now operate a franchise of Homewatch Caregivers based in West Springfield. 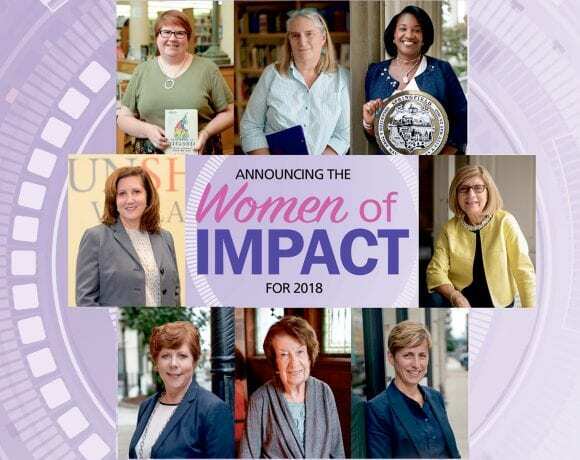 Over the course of roughly a decade in business, they’ve expanded into larger quarters twice, and now have eight office employees and about 100 caregivers in the field, who provide non-medical services to more than 80 clients a week, on average. And like most who have made the transition from employee to employer, they thoroughly enjoy that status. Entrepreneur’s Source helped Tim and MaryAnn Scussel find a career that offers them far greater control over their own destiny. As part of his efforts to market himself and stay in touch with clients and potential clients, Rosenkrantz sends out a number of company-produced correspondences that blend words and pictures to get some messages across — and remind people that he’s there and available for free consultation. Together, they pretty much tell the story of what he does and, to a large extent, how he does it. Opening minds to the full range of franchise opportunities has become an art and a science for Rosenkrantz, a process he knows intimately, because he went through it, from the other side of the desk — figuratively speaking, because most of his work is now carried out virtually, and there is no desk. The story starts with the dramatic downsizing of what was once a chain of Serv-U hardware and home-improvement stores, owned and managed by Rosenkrantz and five cousins. When most of those pieces were sold off — a locksmith operation and decorating center remain — Rosenkrantz commenced a search for what to do next and turned to Entrepreneur’s Source for some guidance. Like many of the people he now helps, he was intent on being in business for himself, and in an interesting twist of fate, one of the franchise opportunities put in front of him to consider was Entrepreneur’s Source. Over the past 11 years, Rosenkrantz, who is paid by franchisors when successful matches has made, has helped script many transition stories for individuals and couples, following those axioms printed on the company’s correspondences, especially the ones about keeping an open mind and finding opportunities in places that one wouldn’t expect. And as he talked about what he does, he returned to that notion of being a life coach and business coach rolled into one. And with that, he summoned that acronym (or phrase) ILWE, which pinpoints the four things he works to help people find. “What we tell people is that you can have a great job and get the first two — income and, if it’s the right kind of job that gives you flexibility and autonomy, the lifestyle as well. What you generally can’t build as easily in the working-for-someone-else corporate world are the last two, wealth and equity. Many of these factors came into play with the Yaffes, who together launched a search for a business to run after Peter parted ways with Casual Corner in the fall of 2001 after a 20-year stint in which he served in many roles, including director of merchandise control. Finding a job, especially one with the salary and benefits he was earning, wasn’t easy in the downturn that followed 9/11, said Yaffe, who told BusinessWest that his search took on a different complexion after he took in a PowerPoint presentation given by Rosenkrantz at a meeting involving the outplacement group he was involved with. The next step was a host of questions that comprise a big part of what Rosenkrantz calls the “discovery process.” Such questions cover everything from personal and financial background to the type of business the potential client believes he or she would be suited for and like to pursue. “He has 500 franchises in his database, and he came up with five he wanted me to validate,” said Yaffe, adding that, while a few of these sparked some interest, he eventually asked for five more. That first batch included a paint business, a stained-glass operation, and a health-and-wellness outfit with a name that escaped him. “Inches Away … Pounds Away … something like that,” he recalled, adding that, while he and Judy gave this option some real consideration, they ultimately concluded that the price — and the opportunity — were not quite right. Somewhere along the way, Yaffe started thinking about home care, and while one of the companies he researched wasn’t in the Entrepreneur’s Source database, Rosenkrantz included a different company, Homewatch Caregivers, in the next batch of five. Making a long story somewhat shorter, Peter Yaffe said he did some extensive research on the Denver-based company, and found it to be the match that the couple was looking for. It wasn’t something they knew a lot about from a business perspective, but they understood from personal experience both the importance of the service and its vast potential at a time when people are living longer and, in many cases, desiring to remain in their homes. So while Judy stayed on at a job as program director of the Hatikvah Holocaust Education Center in Springfield to secure needed benefits (she would join the venture roughly a year later), Peter leased a small space in West Springfield and commenced the process of getting the business off the ground. The learning curve was fairly significant, he said, while echoing some of Rosenkrantz’s literature when he said that it’s not necessarily the type of business one gets into that determines success, but the skills and drive that one brings to the table. As they talked with BusinessWest, the Yaffes stopped to offer a quick tour of their new offices — larger quarters in the same professional building on Union Street in West Springfield they’ve been in from the beginning. They’ve occupied the new space for several weeks now, but wall art and other forms of décor still sit in boxes waiting to be hung — testimony to how busy they’ve been and how successful their business has become. It’s also an indicator of how well Rosenkrantz’ process works, and how people with the right skill sets and requisite measure of resolve can succeed in a business they probably couldn’t have imagined being in. 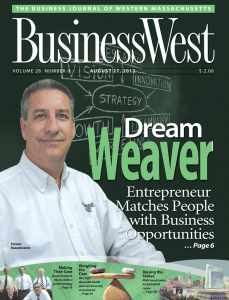 Rosenkrantz, who said that he’s typically working with 30 or 40 people at a time and at all of the various stages of the process, told BusinessWest that his clients’ stories vary widely, but a common denominator is that they’re going through change — loss of a job, divorce, and relocation are just some of the triggers — and figuring out what to do with their lives. And while he works with people of all ages, he says most of his clients are in their 40s, 50s, and 60s and might have achieved the first two parts of the ILWE equation (that’s might have), but are probably still searching for the others. And they possess many of the attributes necessary to be in business for themselves. Franchising certainly embraced Tim Scussel. Indeed, as he talked about his relationship with McDonald’s, he noted that it lasted 35 years — and for roughly 33 of them, things were generally good. But those last two … well, he summed them up with an anecdote or two that effectively conveyed his frustration with the corporate giant. Long before he officially parted ways with the company, Scussel began the search for what would come next. He knew Rosencrantz from his days at Serv-U and counted him as a customer in a small swimming-pool cleaning-and-maintenance business he also operated. After a lengthy period of discovery — ascertaining what the Scussels wanted from their next business venture — Rosencrantz presented them with several options, including a dry-cleaning outfit, a picture-framing operation, and The Maids. None seemed particularly appealing, Tim Scussel recalled, but he did copious amounts of homework on each, eventually had several conversations with the owner of The Maids, and liked what he saw and learned. The couple started with the Hartford location and expanded into Western Mass. with what Tim called a satellite operation in 2006. The Great Recession certainly took its toll — maid service would, in most cases, anyway, fall into the category of discretionary spending — but they rode out the storm and are climbing back to something approaching pre-downturn business volume. Meanwhile, they also have the lifestyle and supportive franchise that were both missing from the equation years ago. A quick look around the Scussels’ facility in West Springfield reveals that they’ve traded golden arches for all things yellow and blue (mostly yellow) — the corporate colors of The Maids Home Services. The walls, marketing materials, uniforms for field employees, and business cards all feature that scheme, and they even have a bright yellow station wagon, decked out with the company name and logo, with which to visit clients and travel between the two locations. But beyond the new colors, they also have a new and different relationship with their franchisor, and, in many respects, a different and better lifestyle. It came about through a unique business matchmaking process, which is both an art and a science, said Rosenkrantz, and a method by which people can truly take charge of their lives.